Despite all the bad publicity and personal past experiences, we maintain that Retirement Annuities are an indispensable investment vehicle, with a wide range of benefits. With the introduction of the Unit Trust industry, the policies have evolved with new product providers offering lower cost Retirement Annuities, with flexibility in fund selection, transparent reporting and flexibility in making changes to premiums and administrators. Preparing for retirement and ensuring sufficient savings – the structure helps you build up capital during your working life. 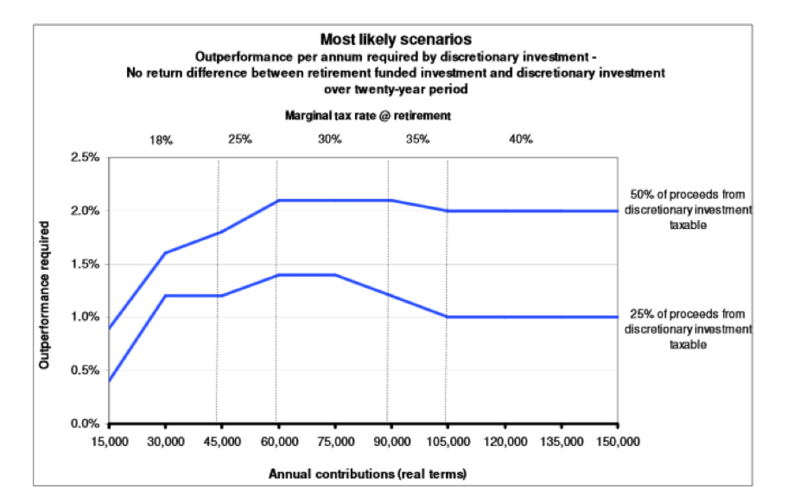 The rule of thumb is that a saving of 15% of your salary over 35 years allows 75% of your salary as an annuity income. Effectively you will only contribute R 63,000 from after-tax cash for a total saving of R 105,000 (SARS adding the R 42,000). Assuming the same underlying portfolio and fees, the two lines show the outperformance required per annum for a Unit Trust Investment against a Retirement Annuity, based on various levels of contributions and therefore tax rates. The higher line is for an investor with a larger interest income and therefore greater taxable portion of proceeds, the lower line assumes less interest is taxable. If R 75,000 is contributed to the two investments per annum and half the interest proceeds of the Unit Trust are taxable at 30%, the Unit Trust will need to outperform by more than 2% per annum to counteract the tax benefits of a Retirement Annuity Structure. On retirement, up to R 500,000 is available as a tax free lump sum – the cash commutation is limited to a maximum of one-third of the capital value, the balance must be used to purchase an annuity to provide income. The power of compound growth and long-term growth – due to the long term nature of the savings, your investment benefits from earning growth on growth. In addition, short term market fluctuations are of less concern as your consistent contributions will average out the variability. Disciplined Savings – You cannot access your capital until you are 55 years old. Some see this as a drawback (listed below); however, we view it as an advantage. This removes the temptation to deplete your savings for other purposes during your working years. Providing for dependents – A Retirement Annuity Fund can be bequeathed to your stated beneficiaries upon your demise. The beneficiaries have the option to take the capital as a cash lump sum, purchase an annuity or a combination of both options. Flexibility of contributions – you can set up a monthly debit order that escalates over time or simply add lump sums on an ad hoc basis. The monthly contributions can be started, stopped and changed at any time without fees or penalties. There are no additional costs and the fees are identical to investing in a Unit Trust. In the event that the full value does not exceed R 75,000 (potentially increasing to R 150,000 from 1 March 2016), the full value of the fund may be taken as a cash lump sum. A Retirement Annuity Fund is not included in your Personal Balance Sheet; therefore upon your demise the funds invested in a Retirement Fund are excluded from your Estate and will not attract any Estate Duty. A Retirement Annuity cannot be ceded or attached by creditors. In the past, prior to the introduction of the “new age” unit trust based policies, Retirement Annuities were sold that paid insurance agents sizeable upfront commissions, resulting in high costs and poor returns for clients. In addition, one-sided and unfair contract conditions were imposed on clients (such as high penalties to move the policy or cease monthly contributions- as high as 30%). The portfolios were opaque and the reporting was poor; clients had very little insight into what was happening with their savings. You cannot access your capital until you are 55 years old. After 55, if you’re Retirement Annuity is greater than R 75,000 (R 150,000 from March 2016), you cannot access more than one-third in cash on retirement. The balance must be used to purchase a compulsory annuity. To take your Retirement Annuity savings abroad, you need to emigrate formally and submit emigration papers to the Reserve Bank. The proceeds will be taxed according to the withdrawal lump sum tax table. After Retirement, the portion that is used to purchase a compulsory annuity cannot be transferred offshore. You will therefore be restricted to an annuity that pays out in South Africa. Regulation 28 attempts to limit investment choice and risk by restricting the allocation to risky assets, such as Equities and Offshore. For long term investors that seek global exposure, these restrictions can have an adverse effect if your Retirement Annuities make up the bulk of your portfolio. Most of the drawbacks discussed above refer to the restricted access to the funds, however, if managed effectively, your Retirement Annuity proceeds can be used to purchase a Compulsory Annuity, providing you with an income over your lifetime. A Living Annuity allows an income withdrawal of between 2.5% and 17.5% per annum. In addition to the Tax Benefits of using the Retirement Annuity structure, we also feel this provides a further security over the capital invested, ensuring that you direct it towards your Retirement. Should you wish to take advantage of the income tax savings by contributing to a Retirement Annuity Fund prior to the end of February 2015, please do not hesitate to contact us for further information and recommendation.